Humanity has overdrawn the planet’s annual budget of resources. Earth Overshoot Day (EOD) this year falls on 1 August, indicating the tipping point where a year’s worth of resources has been consumed. EOD is a symbolic date introduced by the Global Footprint Network (GFN) to measure resource consumption against Earth’s biocapacity, the planet’s capacity to renew or regenerate them. Its purpose is to highlight the impact of humanity on Earth. The date is calculated using Ecological Footprint (EF) accounting, which combines the demand on nature for food, timber and cotton fibres, and carbon emissions from burning fossil fuels and building infrastructure. GFN warns that “ecological overspending” may result in deforestation, collapsing fisheries, fresh water scarcity, soil erosion, loss of biodiversity and climate change, which includes severe droughts, wildfires and hurricanes. These changes may force people to migrate to and burden cities or other countries. He likened the world’s economies to using Earth’s future resources to operate in the present and creating a deeper ecological debt. The current rate of consumption is equivalent to 1.7 earths. “It’s time to end this ecological Ponzi scheme and leverage our creativity and ingenuity to create a prosperous future free of fossil fuels and planetary destruction,” he said. GFN proposed several suggestions to address the situation. Reduce driving by half and replace one-third of the travel distance with public transportation and the rest by walking and biking. Halve the carbon component of the EF, such as reducing meat consumption. GFN said it takes 14 times more land to produce a ton of beef than a ton of grain, while pork production requires 1.9 times more. Global livestock contributes at least nine percent of manmade carbon emissions. Reducing food waste by half and consuming world-average calories will also help. GFN said if every other family in the world had one child fewer, EOD will move back 30 days by 2050. GFN’s data found that 86 percent of the world’s population lives in a country with an ecological deficit. However, it noted that China, with the largest total EF, decreased 0.3 percent from 2013 to 2014. The EF per person in China also fell by 0.8 percent. It also noted that EF per person for high-income nations has declined 12.9 percent since 2000. Notable declines were seen in Singapore, the Bahamas, Denmark, United States (US), United Kingdom (UK) and France. The concept of EF was promoted in a 1996 book called Our Ecological Footprint by Wackernagel and ecologist William Rees. The GFN, founded in 2003, now owns the EOD. However in 2015, US-based think tank Breakthrough Institute criticised the EF as a fundamentally flawed indicator as it is calculated based on just one source, carbon dioxide. It does not show ecological depletion for other categories it measures. For countries' EF, the annual domestic production of resources such as crops and timber is compared with their consumption by the country’s population. However, for countries like Singapore where natural resources are limited and demand for resources are met through imports, it will always be in deficit. Singapore has a shocking 9,890 percent biocapacity deficit. To compute ecological balance or surplus, a country has to be self-sufficient. The EF does not measure sustainability. Farming activities can cause pollution, water depletion, soil erosion and deforestation, none of which are measured by the EF. The EF may be useful in measuring forests and fisheries, as it uses United Nations (UN) statistics to compare timber harvests against annual growth, and fish catches against natural regeneration of fish stocks. The Breakthrough Institute argued that the entire overshoot is actually human emissions of carbon beyond what the ecosystem can absorb. The 0.7 extra earth is essentially the land area needed for forests and other carbon sinks to balance the emissions. Wackernagel conceded that factors such as soil depletion may be factored into the EF but added that such data sets do not exist within data published by the UN and would likely produce an even larger global overshoot. Earth Overshoot Day still remains relevant as a means to raise global awareness of the earth’s resources. 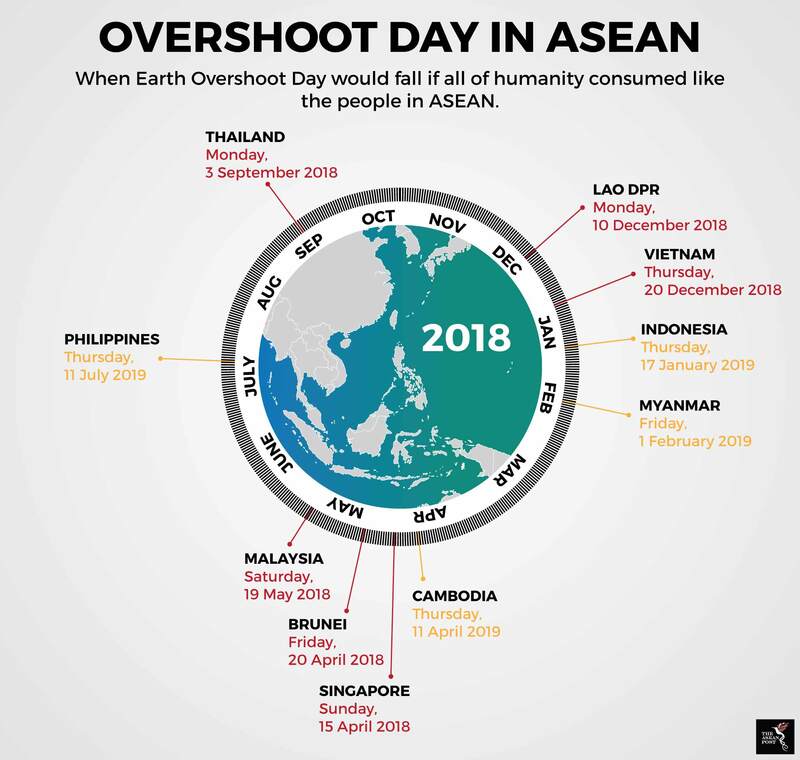 Out of curiosity, The ASEAN Post computed the data provided by GFN and found the world might be “celebrating” EOD prematurely: the overshoot should fall on 12:34pm 4 August, 2018.